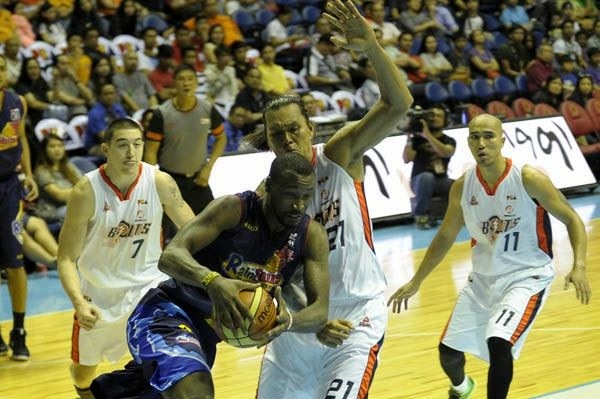 MANILA, Philippines – After stealing game one of their best-of-five battle from Meralco, Rain Or Shine (ROS) rained threes to give Coach Norman Black another unforgettable beating and let the thunder struck the Bolts twice with 92-82 win on Easter Sunday, April 5, 2015 at the Smart Araneta Coliseum in Cubao, Quezon City. Elasto Painters Head Coach Yeng Guiao continued his unorthodox player-rotation by fielding in another set of “Super Subs” in Jericho Cruz, Jervy Cruz and TY Tang along with his common starters Gabe Norwood and import Wayne Chism in the beginning quarter of game two. Jericho Cruz, showed-off early in the first quarter by opening the score board with his fast break lay-up and back to back three pointers. Gary David on the other hand, matched Cruz’s offensive aggressiveness with his own version of treys and inside shots to grab the lead 19-11 or 13-0 blast in less than seven minutes after the tip-off. The former Adamson Falcon shooting guard Jericho Cruz, surprisingly survived the opening quarter with 10 points, 1 rebound and 1 steal. His best start in his young PBA career. But the Meralco Bolts were still up ahead by 11 points, 27-16 after 12 minutes of exciting basketball game. With a double digit Meralco lead going to the second period, Rain Or Shine moved on without its usual go-to-guys. Instead, Ibanes, Arana, Quinahan, Almazan and Lee started quarter number two. A scuffle almost erupted in the 6th minute mark of the second canto between Sean Anthony and Big Beau Belga, when Rain Or Shine big man accidentally landed a knee on Meralco import Josh Davis who was down on the floor after a hard drive to the basket. Referees immediately ran towards the two heated players and broke them up. Chris Tiu, Paul Lee and Beau Belga all fired shots from the rainbow country to cut Bolts’ scoring momentum and trim the 12-point lead into just 3 with four minutes remaining before the half time break. Hard court heart-rob Chris Tiu and Paul Lee sank another back-to-back treys for the equalizer but Josh Davis reacted quickly to regain the lead 47-44 at the half. Wayne Chism duplicated his only 4-point first half low on their game one encounter while his counterpart, Josh Davis had 13 points marching on the third. Just like the opening quarter, Coach Yeng opted to start the third quarter with his “Super Subs” Jericho Cruz, Jonathan Uyloan, Raymond Almazan with full-timers Gabe Norwood and Wayne Chism. Still no signs of Rain Or Shine and Gilas Pilipinas gunner Jeff Chan on the floor who was spotted on the bench in complete uniform and warmers. Chan is suspected to be nursing an injury. Jonathan Uyloan and Jericho Cruz who had a career high of 15 points continued to shine for Rain Or Shine with their triples and snatched the lead from Meralco with less than seven minutes in the third despite of Wayne Chism’s 11-point off-night performance. Paul Lee and Christ Tiu joined the “Super Subs” in three point shooting spree to increase their lead 76-61 after the third period. Josh Davis overplayed Wayne Chism with his usual double-double efforts 25 points and 17 boards but still failed to even the series. Basketball gods were on Rain Or Shine’s side as Paul Lee and the “Super Subs” continued to wax hot in the rainbow territory and recorded 19-38 3-point field goals, 50% shooting after 48 minutes of basketball action. Lee exploded with 23 points to win the Best Player of the Game award and a top candidate for the Best Player of Conference award. The Raymond Yu and Terry Que Team will have a chance to close the series on Tuesday and move up to finals against the series winner of Talk ‘N Text vs Purefoods.